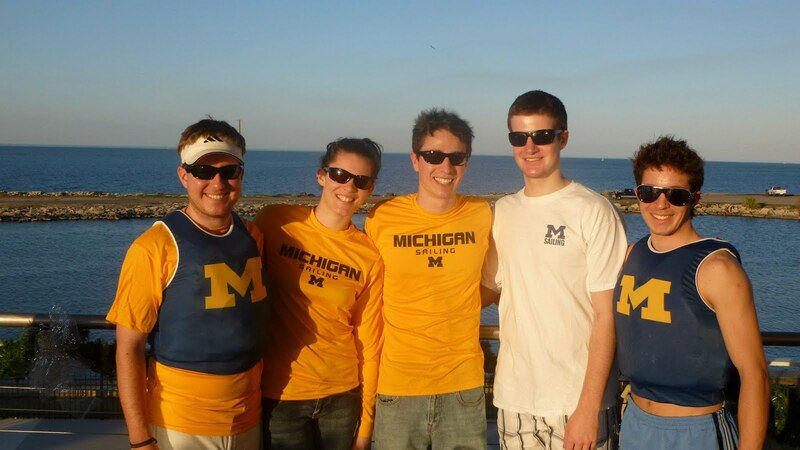 Sailing Team members Sammy Barbour (‘12), Kathryn Burt (‘13), Matt Graham (‘13), Ryan Seago (‘14) and Scott Ismail (‘14) traveled to New Orleans, Louisiana for the Allstate Sugar Bowl regatta to finish off 2011. The Sugar Bowl was an intersectional hosted by Tulane out of the Southern Yacht Club, on Lake Ponchartrain. A total of 11 teams attended with Wisconsin and Ohio State from the MCSA as well as many southern teams, providing a unique match up. The team members left Michigan on December 27th for the two-day drive down to Louisiana. Matt met the group there as he drove himself from Oklahoma. Racing began on the 30th with four races in the A division followed by four races in the B division. The air was light and shifty, but the race committee did a good job of continuing racing. More races brought Michigan to second place overall at the end of day one. On the last day of the regatta, and the last day of the year, the club was beset by heavy fog. Racing was delayed a little while because of the foggy, windless weather. Eventually the race committee sent the fleet off for two more rotations per division. Racing ended after 3 p.m. with ten races total in each division. Michigan won the regatta overall by a point and finished second in each division. Congratulations to the 2011 Sugar Bowl regatta champions, and Sammy Barbour, who sailed his last college regatta. Full results can be found here. The Michigan Sailing Team would also like to thank the Gahagan family, who were so kind to host the team members and provide them with a New Orleans experience full of Southern hospitality! Back on October 4th-6th, Ellen Dubois qualified to sail in the ICSA Singlehand Nationals regatta. It had been several years since a University of Michigan sailor had qualified for this regatta, so everyone was excited to see how it went! The regatta was held in Chicago, a nice easy trek from Michigan compared to other schools. There were 18 girls who competed in this regatta, all having to qualify from their conferences. The women sailed in Laser radials. The regatta was held in chilly conditions and most sailors did all they could to stay out of the cold Lake Michigan water. Friday began with light conditions with a lot of left over chop from the night before. The conditions were far from ideal, yet Ellen had her best finishes of the weekend in these conditions. The race committee opted to only do 4 races the first day, planning to get most of the races in on the second and third days. The second day had much better conditions. The breeze was between 8-14 all day, with considerable chop still, but much more manageable. The race committee did a whopping 8 long races. After the second day, Ellen sat in 17th. On the last day, the sailors arrived to the yacht club with the wind howling and waves crashing over the break wall. The wind was steady 20's with gusts up to 30. They sent the sailors out planning to get off several races, but only managed to do one after the majority of the fleet was capsized for most of the race. They sent them to shore for postponement but the wind never calmed and racing was cancelled for the weekend. It was a successful and rewarding experience for Ellen, finishing 17th/18th, sailing against many of the top women sailors across the country! Congratulations to the new executive board! 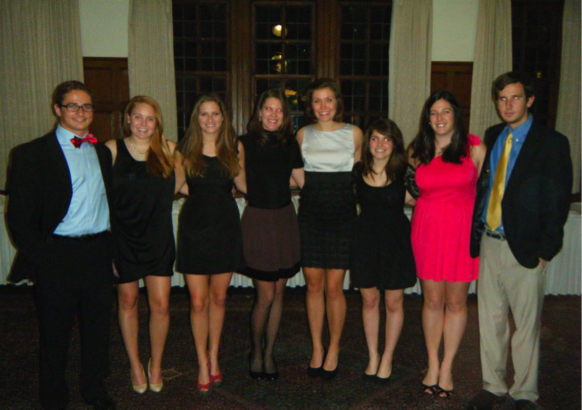 Elections were in December and the new team leadership transitions in this week. Congratulations to the team that traveled down to New Orleans this holiday break to sail in the 2011 Sugar Bowl Regatta. The event was hosted by Tulane University at Southern Yacht Club and sailed on Lake Pontchartrain. Each division sailed ten races and after two days of close racing Michigan finished the regatta in first by 1 point over Georgia Tech. Full results can be found here. Happy new year to all as the team looks forward to another great season.